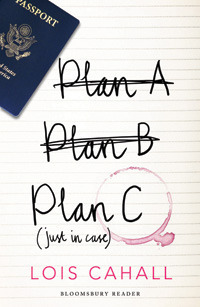 Plan C : Just In Case by Lois Cahall. Plan A: We grow up, get married, have babies, white picket fence. Plan B: Mortgages, marriages, mistresses, divorce, my kids, his kids, stepkids, blended families. College tuition. Empty nest. Empty soul. Plan C: Cabernet, passports, jet lag, Ambien, Europe. Who needs reality? Until we realize reality can't be avoided. And truth is, we don't want to avoid it. We are a nation of underdogs—a society of hope. Plan C is accepting life as it comes, with no plan at all. Plan C is the story Libby Crockett, a divorced and single mother in her forties looking for a fresh start, which, she gets but it's too messy. Ben, his ex-wife, their kids, her kids and the drama going on with her friends all together make her life in New York so overwhelming that she and her friends, Kitty and Bebe decide to drop what they're doing and take off to Europe hoping to figure things out. >As far as women's fiction go, Plan C by Lois Cahall is pretty standard with elements of chick lit and romance. We follow the three ladies and their adventures in Europe while they're trying to 'find themselves'. Libby and her friends are witty, relatable and engaging. Although, the story sometimes got a bit too corny for my taste, over all it was pretty funny, entertaining and light. Libby was quite charming and really funny. Although on the surface Plan C may be about a getaway plan, this book was more about finding love, happiness and contentment, just with a funny front. I like how the book focused on not just Libby but also gave us a bit of all the other people around her. The supporting characters actually played a part in making the book enjoyable and that's kind of a first. Predictable and cheesy at times, Plan C is still humorous enough to keep the reader entertained for a few hours. It makes a pretty nice feel-good novel. Michelle Zink Needs Your Help!